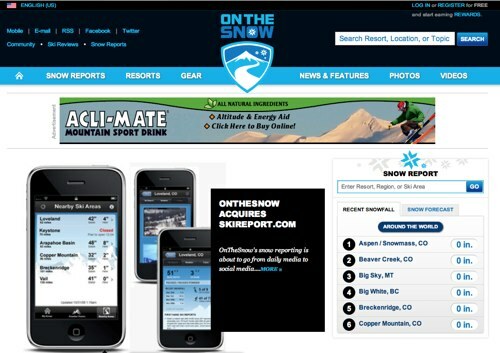 Mountain News Corporation, publisher of ski portal OnTheSnow has acquired its main competitor SkiReport.com. OnTheSnow and SkiReport will be merged for the forthcoming winter ski season, delivering a combined audience of 12 million unique visitors a year. The acquisition would appear to be primarily focused on mobile, with Skireport delivering the company an additional 860,000 mobile application users with an estimated 54 million in screen impressions, to create a total mobile application base of 945,000 users. Along with ski reporting, both sites offer a range of news and video.